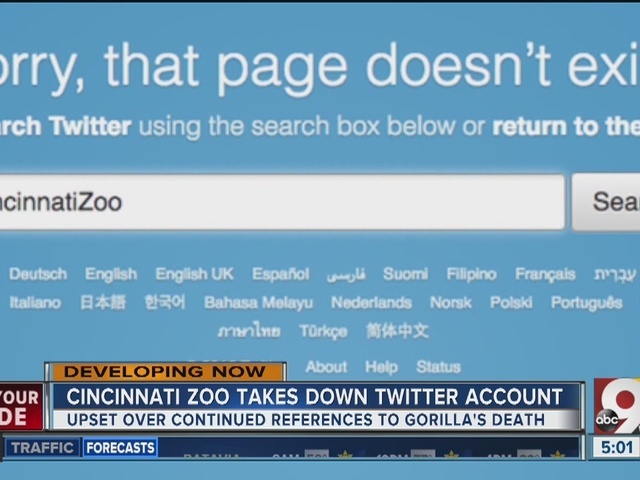 CINCINNATI -- The Cincinnati Zoo deactivated its official Twitter account Monday night after its director pleaded with the public to stop spamming zoo social media with Harambe memes. "We are not amused by the memes, petitions and signs about Harambe," Thane Maynard, Cincinnati Zoo director, told the Associated Press. (Maynard's personal Twitter account was hacked Sunday and briefly repurposed in service of the Harambe meme agenda.) "Our zoo family is still healing, and the constant mention of Harambe makes moving forward more difficult for us. We are honoring Harambe by redoubling our gorilla conservation efforts and encouraging others to join us." Maybe zoo officials should have known better than to show weakness in front of a predator as relentless, well-adapted and rich in free time as the internet troll. Maybe they should have known that their well-intentioned offerings of animal trivia, conservationist messages and cute baby giraffe pictures had been laid on the altar of a digital god that only wanted one thing. And maybe it's our fault, too, for writing news articles and columns about the whole situation . Sorry about that, guys. Yeah. Rest in peace, @CincinnatiZoo. Maybe people will be screaming your name over golf matches next.